A ‘status orange’ weather warning remains in place for much of the country. Frosty weather in Wicklow last month. MOST AREAS OF the country are waking up to a cold and frosty start, after sub-zero temperatures overnight. A ‘status orange’ weather warning remains in place for much of the country until 10am this morning. Temperatures were forecast for as low as minus six degrees overnight. The coldest temperatures this morning are in the Midlands area. In Offaly, as of 6.50am this morning, the latest Met Éireann temperature reading was minus five. 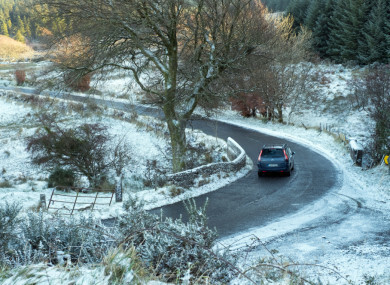 AA Roadwatch is reporting slippery conditions on the Midleton-Dungourney Rd (R627) at Ballincole Cross in Cork this morning. Expect frost and ice on roads in these areas and remember stopping distances are 10 times longer in such conditions. Slow down and leave yourself more time to reach your destination. It will be a mostly dry day later, but staying cool – temperatures of 2 to 5 in many areas, a few degrees warmer along the south and southwest coasts. Tomorrow will be cloudy and windy with some heavy rain later in the day. Email “'Slow down': Driver warning after temperatures plunge to minus 5 overnight”. Feedback on “'Slow down': Driver warning after temperatures plunge to minus 5 overnight”.